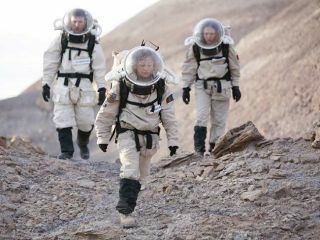 An educator shows his students the martian landscape during the March 2007 FLAME expedition to the Mars Desert Research Station in Utah. Robots andhumans always seem to end up at odds, whether it's battling over pieces ofNASA's budget or literally fighting in science fiction stories such as "TheMatrix" and "Battlestar Galactica." Now aformer NASA historian and an American University professor suggest that thefuture of space exploration could very well depend on a merging of metal andflesh. Their newbook "Robots in Space" (2008, The Johns Hopkins University Press) looksat the competing visions for robotic vs. human space exploration, and concludesthat neither will get far beyond the solar system without one another. That meanshumans may need to draw from the Sci-Fi realm yet again and morph intosomething new, like a cyborg, to head for distant stars. Humanefforts dominated early space exploration because machines simply lacked thebrainpower. Even Arthur C. Clarke, the visionary science fiction author who died recently,first imagined a network of geosynchrous communications satellites as spacestations with human operators onboard. Germanscientist and American space pioneer Wernher Von Braun drew support for humanspaceflight from the Cold War rivalry and from pioneering themes of theAmerican West. The public imagination was fired up by early speculation thatplanets such as Venus and Mars harbored Earth-like conditions for life —something that robotic explorers later found to be untrue. "Wewere certainly interested in the fact that none of the spaceflight godfatherswho talked about flying in space really focused on the robotics side,"said Roger Launius, National Air and Space Museum senior curator and co-authorof "Robots in Space." Roboticcapabilities gradually improved and allowed cheaper robotic missions to makelong journeys to the outer planets. At the same time, near-Earth human programssuch as the space shuttle and International Space Station racked up billions ofdollars in unanticipated costs. Manyscientists now support robotic missions as cheaper alternatives to humanmissions, but human spaceflight advocates still dream of returning people tothe moon and perhaps even going to Mars. However,support for the dream of human spaceflight has fallen away with the end of theCold War and the pioneering American West receding into historical memory. Thatleaves a gap in the public imagination that robotics has yet to fill. "Thelack of a compelling story associated with robotic spaceflight means that sideof the equation has not been developed as well as the human side," Launiussaid. Launius andco-author Howard McCurdy of American University argue that NASA needs to take ahard look at its real goals in space exploration. Among five major reasons theylist to go into space — including scientific discovery, commercialapplications, national security, geopolitical prestige, and survival of thespecies — only the last absolutely requires humans. That bluntassessment is unintentionally echoed by the artificial intelligence Agent Smithof "The Matrix," who sneers "Never send a human to do amachine's job." Smith may have a point despite his villainous nature, asrobots increasingly become cheaper and safer proxies for humans on dangerousspace missions. "Nobodytold Spirit and Opportunity [Mars Rovers] that they're on asuicide mission," Launius said. "If the objective is science, that'sall well and good." Humanspaceflight advocates who want to see people get off Earth have a legitimatecause, according to the authors, but need to openly discuss that rationaleinstead of masking it. "Ifobjective is to become multi-planetary species, then we have to flypeople," Launius noted. "I wish we were a bit more honest about that." Fundinghuman spaceflight based on survival of the species would be a hard sell,though, and may just get harder. Several national and online surveys have showna trend where 18-24 year-olds largely oppose sending humans to Mars, citingreasons such as "too far and too much money" and the risks toastronauts. On theother hand, many young adults express more enthusiasm over robotic missions toMars, such as the Spirit and Opportunity rovers. "Whatwe find is that young people seem to be able to relate much more easily torobotic missions, and therefore get more excited about them," said MaryLynne Dittmar, President and CEO of Dittmar Associates, Inc., who conducted somesurveys. Perhaps theonly thing that can inspire fresh zeal for space exploration comes from findingnewEarth-like planets around other stars, according to Launius and McCurdy. However,humans and robots can't even attempt an interstellar journey yet. Robots lackthe mental power and flexibility to conduct distant missions far from humanhandlers, while humans remain vulnerable to the effects of space radiation,aging, and other physical hazards in space travel. A solutionmay arise from the vision of futurists such as Ray Kurzweil,who sees humans and robots eventually merging to combine the best traits ofboth. That's not entirely a fantasy. "Inthe process of enhancing yourself technologically, you've become a cyborg,"Launius said, listing glasses, hearing aids, pacemakers, and hip replacementsas examples of technological aids people use daily. Launius and McCurdy alsopoint out that NASA conducted studies on cyborg technologies in the 1960s. The idea ofhuman-robot hybrids is popular in science fiction, and most recently in thecritically acclaimed show "Battlestar Galactica." The show depictshumans fighting for survival against robot-like Cylons, but also examines whathappens when certain Cylon models have biological parts and appear human. "Thehumans in the show view the Cylons as machines and not entities which theyshould have any compassion or concern for," Launius observed. That allowsthe humans to justify killing or torturing Cylons, although the line betweenhuman and Cylon has become blurred as the show enters its fourth and finalseason. So the realquestion may not be if humanity reaches for the stars, but what it needs tobecome to do so.